Back in August, I made some excited noises about the new head-to-head skirmish game from Wizards of the Coast, Dungeon Command. At the time, only two Faction Packs were available: Heart of Comyr, including a human ranger, halfling sneak, dragon knight, dwarven defenders, and copper dragon; and the Sting of Lolth, which contained the drow assassin, priestess, wizard, spiders, and umber hulk. Now, if you’re like me, you probably wondered what a “Faction Pack” was, and how a “head-to-head skirmish game” might work. But that was really secondary, because all the cool toys packed inside were more than worth the money. If you had to justify the purchase, you could do it on those alone — Dungeon Command components are fully compatible with the Wizards of the Coast games you’re already playing. The miniatures and dungeon tiles can be used with the D&D RPG, and the unique cards provided with each miniature can be used with D&D Adventure System board games like Castle Ravenloft, Wrath of Ashardalon, and The Legend of Drizzt. You don’t have to be an expert on head-to-head skirmish games to appreciate that they’re a lot more fun with a variety of miniatures. 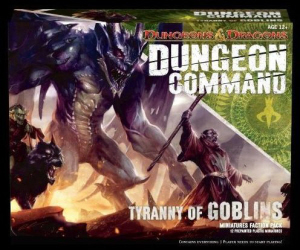 So I was intrigued to see the recent arrival of two new factions: Tyranny of Goblins, containing a complete goblin warband — including bugbears, wolf riders, a feral troll, and a hobgoblin sorcerer — and Curse of Undeath, which includes the gravehound, lich necromancer, and dracolich. 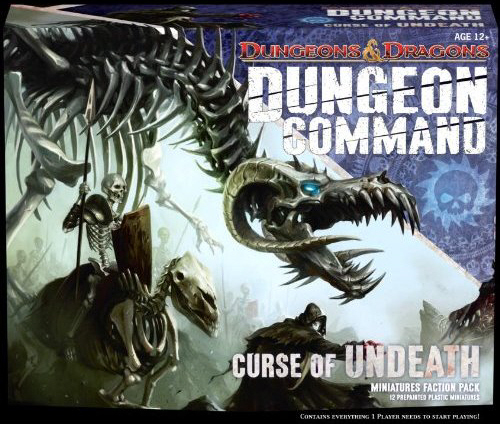 Dungeon Command features themed miniature factions designed to play as unified war bands. The game eliminates luck-driven mechanics in favor of player-driven skill, creativity, and quick thinking. Each faction comes in its own box, with a dozen miniatures, a set of unique cards, dungeon tiles, and the game rules. I’m already hearing reports that the miniatures — and the new rules set — have found favor among roleplayers looking for a quick and refined combat system. Stay tuned for further reports as we experiment with the rules here at the Black Gate rooftop headquarters. Assuming we ever stop playing with the cool minis long enough to read the rules, that is. Both Tyranny of Goblins and Curse of Undeath retail for $39.99. They were released by Wizards of the Coast in October and November, respectively. Good review. I went and picked up tyranny of goblins yesterday. I was looking for a skirmish game anyway. Excellent! Let us know what you think.